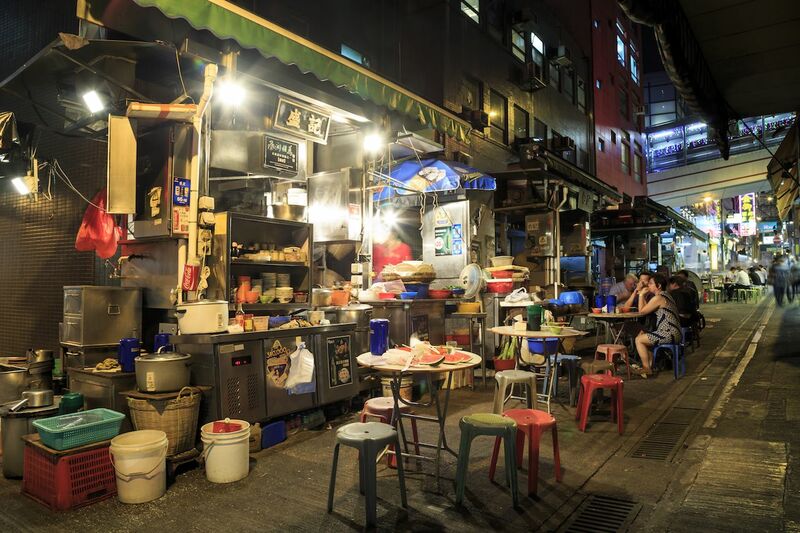 Street food has been an essential part of Hong Kong’s history long before it became Asia’s financial capital. Early in the 19th century, small food stalls began to appear and quickly gained popularity for serving affordable meals to low-income workers. Around 1945, the government began issuing licenses an attempt to regulate the street food scene in the city. 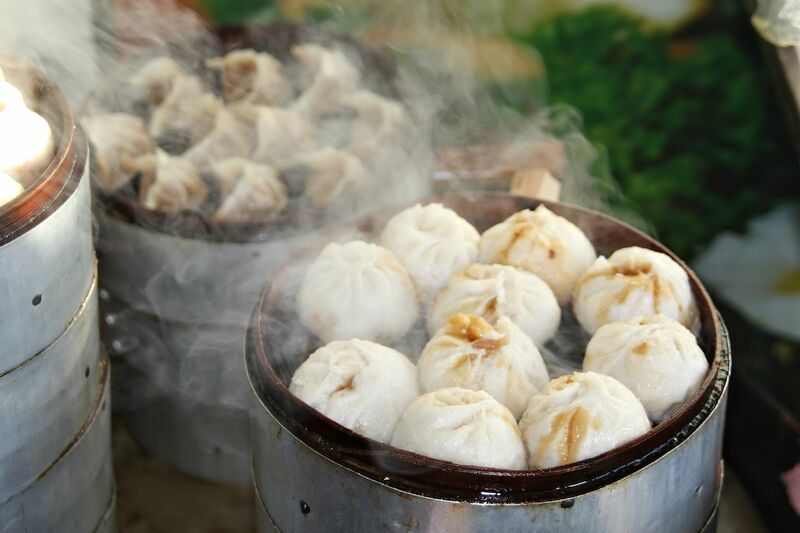 The street food stalls came to be known as “Dai Pai Dong” or big license stalls. Dai Pai Dongs continued to grow in popularity and eventually, many street vendors gathered together in local markets instead of selling food individually. Over the years, Dai Pai Dongs faced the wrath of government regulations, and a recent food truck scheme by the government threatens to replace them completely. And yet, Dai Pai Dongs persist, thanks to the special place they hold in the heart of locals. It is, therefore, no surprise that to truly experience Hong Kong, you must explore the one thing that defines Hong Kong: its street food. While identifying individual Dai Pai Dongs is a daunting task, there are some areas which feature a collection of local stalls. Graham street in Central, Fa Yuen Street, and Sai Yeung Choi Street South in Mong Kok, Temple Street in Yau Ma Tei, Fuk Wa Street Market at Sham Shui Po, Hai Fook Street and Haiphong Street in Tsim Sha Tsui are some of the famous ones. 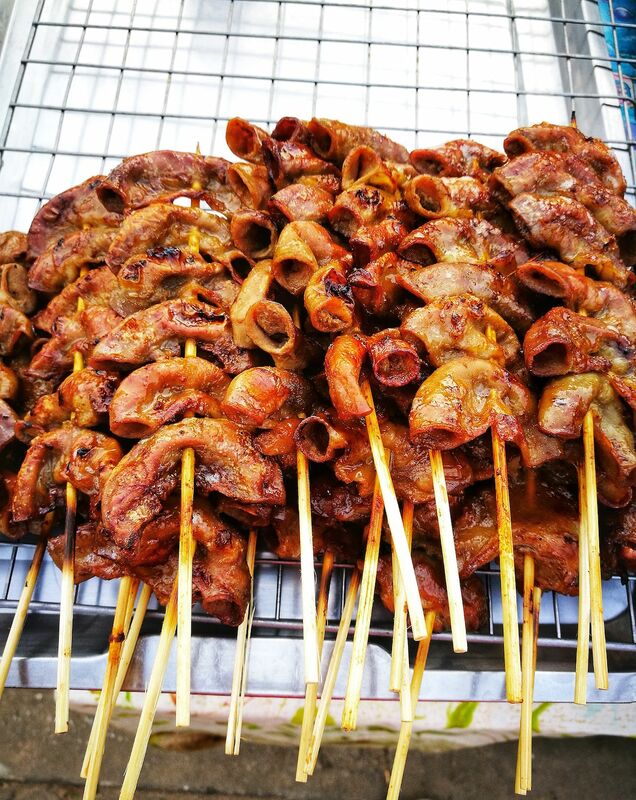 When you are there, here are 9 awesome street foods you absolutely have to try. Without a doubt, Siu Mai, steamed dumplings, is one of the most popular street foods in Hong Kong. Almost at every corner of the city, you can find a stall that sells these savory steamed dumplings with a splash of chili oil and soy sauce. While there are countless variations of this dish, the traditional Cantonese version of Hong Kong is made of fish/meat paste, ground pork, black mushroom, scallion, and ginger. Wrapped in a thin yellow wheat dough, Siu Mai is arguably Hong Kong’s favorite dim sum and an essential part of the street food journey. Originally from Chiu Chow and Fujian provinces, Gaa Lei Yu Dan (fishballs) have been a popular dish in Southern China since the Qing dynasty. At first, fishballs in Hong Kong closely resembled the Chiu Chow style (white and boiled). The people of Hong Kong then added their own method by frying the fishballs until they become golden. Made from freshly ground fish paste, the best fishballs are hand-beaten, rather than being machine-molded to ensure the perfectly smooth and bouncy texture. A spicy and tangy curry sauce adds the final touch before it gets served on a stick. 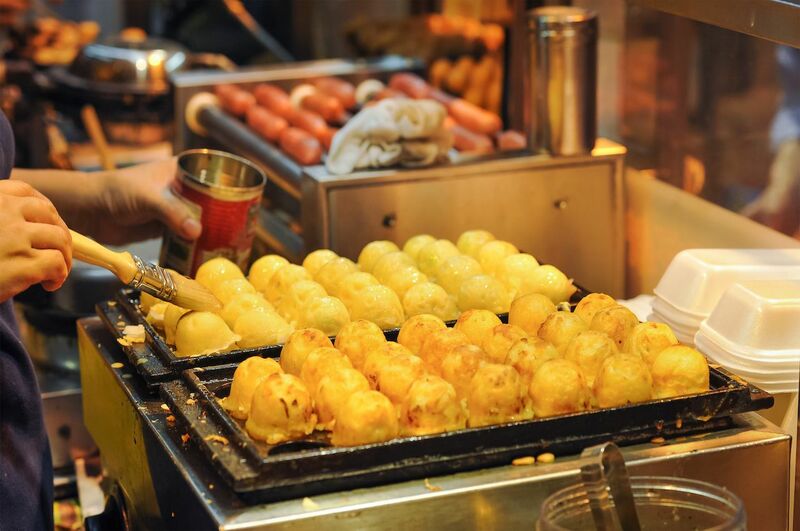 If there is one food that defines Hong Kong, it would be curry fishball. An iconic snack of Hong Kong, the Bo Lo Bao, pineapple bun, is a soft bread with a crunchy, flaky, and sugary crust. Ironically, there is no pineapple in the bun; it is called so due to its visual resemblance to a pineapple. Commonly served with a thick slice of butter sandwiched right in the middle, the pineapple bun is the perfect guilty pleasure snack. Personally, for me, there is nothing like the joy of walking past a bakery and smelling the aroma of a freshly baked Dan Tat, egg tart. 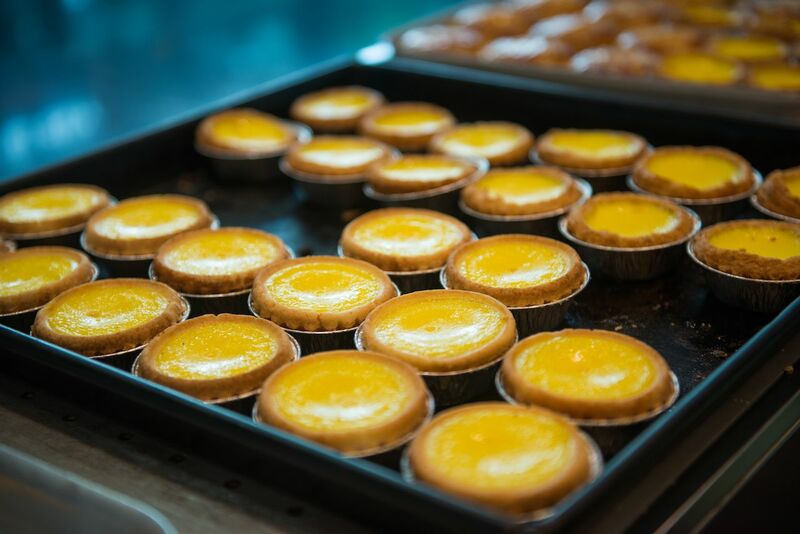 While there is a lot of debate about the origins of egg tart, a popular opinion states that it was brought over during the 1940s from Macau, which used to be a Portuguese colony. 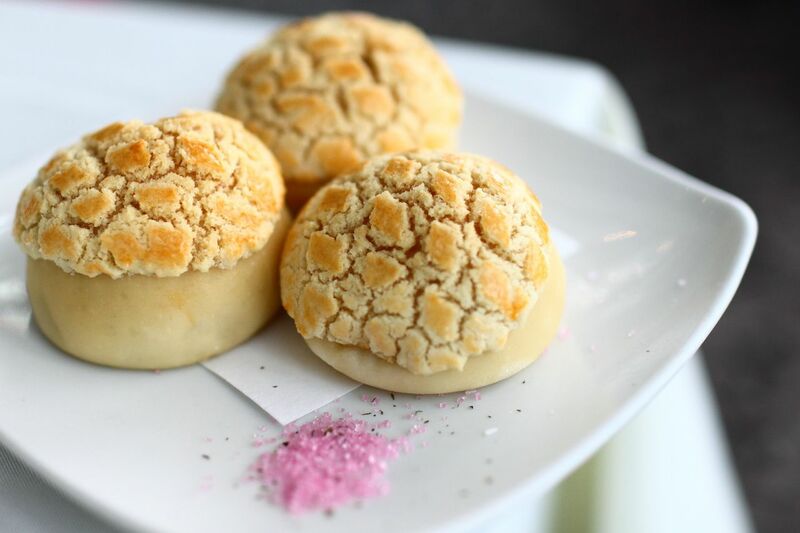 Over time, they were popularised by local cha chaan tengs (Hong Kong’s version of all-day diners) and eventually traditional bakeries like the famous Tai Cheong Bakery. Today, egg tarts have become the perfect company for afternoon tea but they are also pretty much consumed throughout the day. Needless to say, the famous ones sell out within hours as most people buy these by the box. 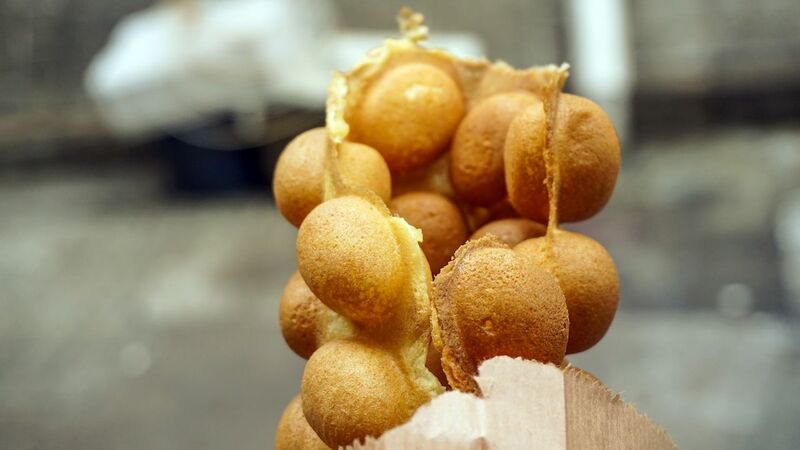 Eggettes, egg waffles or egg puffs are an indispensable part of childhood in Hong Kong. Made from eggs, sugar, and flour, these chewy golden yellow pancakes closely resemble the western style waffles but they are covered with fluffy bubbles. The bubbles should ideally be crunchy on the outside and soft on the inside. Behind the honeycomb-like structure lies an interesting hearsay story. A grocery store in the 1950s received a broken and unsellable shipment of eggs but the owner decided to experiment with it rather than throwing it away. He put the eggs into a mixture of sugar, flour, and evaporated milk and poured them into an iron cast mold which was shaped like honeycomb. And the legendary egg puff was born. Nowadays, the egg puffs come with a choice of spreads like chocolate, strawberry, matcha, and coconut. True to its name, Cau Dou Fu, stinky tofu, does have an overpowering pungent smell that may drive away many first-timers but these chunks of crispy fried tofu actually have a mild and pleasant taste. The rancid smell is actually a result of a mixture of fermented milk, fish, and meat. 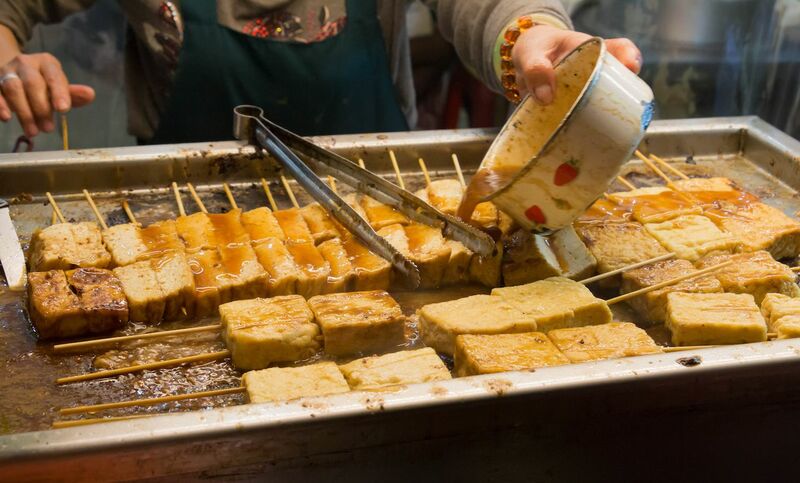 Served with sweet chili sauce, trying stinky tofu is an adventure that you are not likely to forget. Here is a classic example of international food modified to suit local flavors. 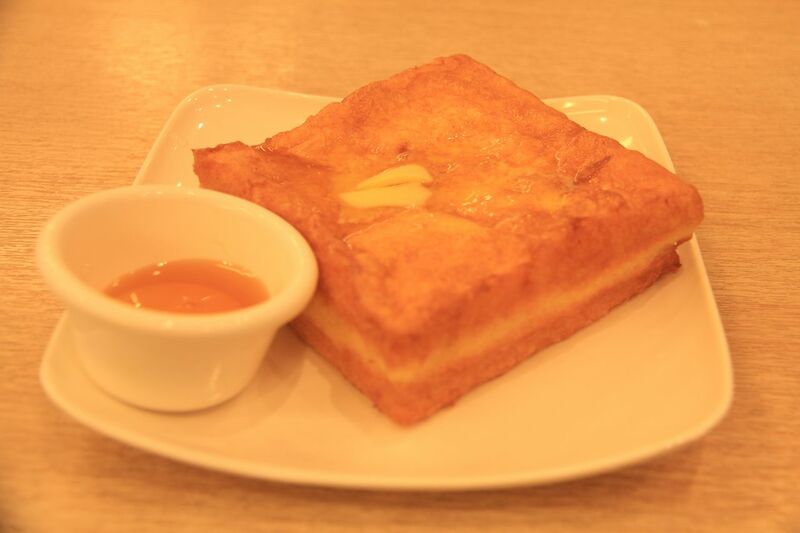 Hong Kong style French toast is different because it is deep-fried rather than pan-fried. Popularly found in cha chaan tengs (Hong Kong style local cafes), this unique dish features two slices of thick bread coated with egg. In between the two slices of crispy fried bread is usually a generous spread of peanut butter. To kick it up a notch, this combination is topped with butter and served with maple syrup on the side or spread on top. Creative and delicious, the Hong Kong style French toast is a perfect product of the cultural amalgamation this city has witnessed over the years. Crispy and deep fried on the outside and juicy and chewy on the inside, Ja Zu Da Cheung (pig intestines) is a surprisingly flavorful snack. For those worried about hygiene, it is worth knowing that the intestines are rigorously cleaned, soaked in hot water and then stewed or fried with spring onions before served on the stick. Topped with some mustard and sweet sauce, Ja Zu Da Cheung may just become the favorite part of your street food journey in Hong Kong. Wun Jai Ci, faux shark’s fin soup, is a shark-friendly alternative to the traditional shark fin soup. The imitation version is made of vermicelli, mushrooms, eggs, and sliced pork loin and started out as an affordable version of the original. Today, it continues to remain the classic winter comfort food of Hong Kong, without violating any ethical boundaries. My parents always said ‘We are Chinese.’ I never understood until now. You’re drinking sake wrong. Here’s how they do it in Japan.